More of the Kitchen Story! 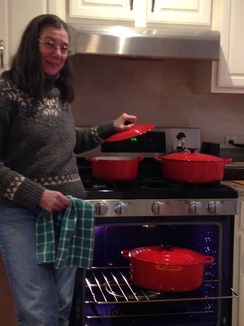 Darn if some new pots haven't shown up! Just the ones mama wanted, too. On December 21st, the last day of Fall, a bunch of us were delivering the Gemini 105c, Felix, to Newport from Marion. 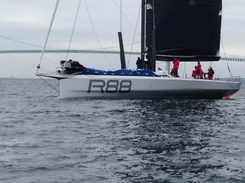 Rambler 88 was out on sea trials in Newport Harbor. I captured a couple of quick pictures on my iPhone. I think she is pretty and looks fun to sail. 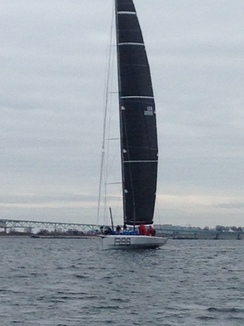 I read that she is a new design from Juan K. Later in the day, we viewed R100 on the hard at Portsmouth. 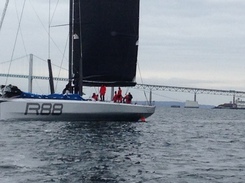 I will be looking for a Rambler at winter races, maybe in the Caribbean for the "600" starting in February. Roll on Rambler! Design is a moving target. Sometimes it is shape and sometimes materials. Most of the time these days it is both. American designers, years and years ago, preferred the wide shallow hulls to the English narrow deep ones. Now we have wide hulls with very deep drafts and the boats really scoot. A lot of the reason for speed is materials and computerized engineering. Averisera was a quick and radical design in her day, the late 1970s. Bob Perry wrote that she was an ultra-light when introduced, narrow and light. 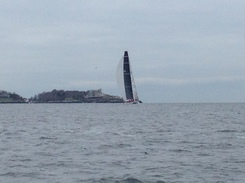 The Aphrodite 101 was followed by the Olson 30 design which was even faster, narrow and light. I think it was Tom Wylie who got the wide and light with water ballast movement going with his first Mini Trans-At 6.50. Any way one looks at it, R88 is the newest boat in a long list of developments in yacht design. Fun thing to see her ghost by. It will be fun to follow R88.